With Valentine's Day just around the corner, its time to start thinking about how we're going to spend the day - will you be spending it with your other half, having a night out with friends or just showing yourself some love with a good old pamper? 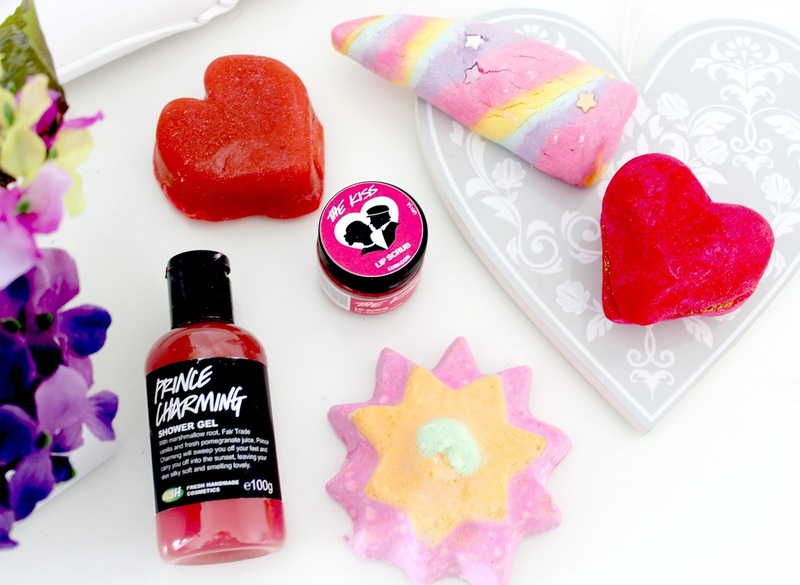 Whatever you decide, there's always time to fit a LUSH bath into your routine and they've released a limited edition Valentine's Day collection especially for the occasion. Much like Christmas or birthdays, Valentine's is just another excuse to treat yourself so this range of bath products couldn't be more perfect. Plus, they'll leave you smelling sweet if you've got a big date night planned! My boyfriend and I have decided we're going to cook a nice three course dinner and get a bottle of our favourite fizz instead of going out and although we won't be leaving our flat, I still intend to get glammed up and make a bit of an effort so I'm looking forward to having a pamper in the bath with some of these treats. Here's a bit more about the range which I was very kindly sent to review. As you can see, the whole range is made up of pretty red, pink and pastel tones - all of which are perfect for Valentine's day! 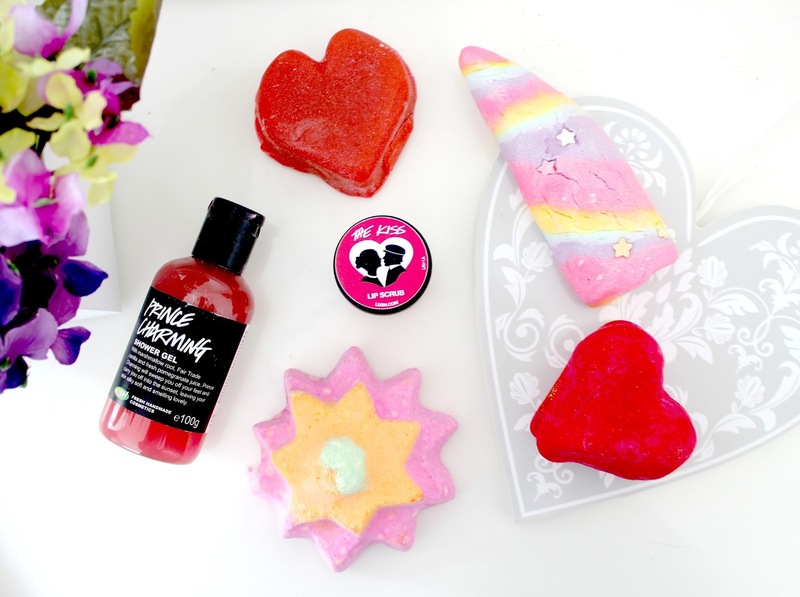 The two most obvious Valentine's products are Heart Throb, a bright red heart shaped bubble bar with lots of glitter in the middleand Cupid's Love soap. I really love both of these, especially the bubble bar as it contains essential oils and softening shea butter so its perfect to use before a date as your skin will feel super silky! Plus, it will make the bath red, glittery and bubbly! Soap isn't something I'm too keen on buying from Lush, not because it isn't great but because I'd rather spend money on the more fun products. However, if soap is your thing, this one has a gorgeous fruity fragrance thanks to Bergamont and Rosewood as well as fresh figs, passion fruit juice and soya yoghurt nourish and soften the skin. Next up is another two bath products, Unicorn Horn bubble bar and Floating Flower bath bomb. These two products are made up of pretty pastel shades so they don't have the stereotypical Valentine's theme but they're very pretty regardless and will make your bath a pretty and pink! 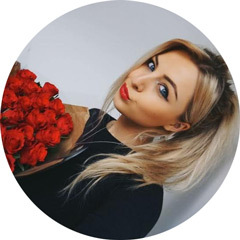 I do love a LUSH bath bomb so I'm excited to use Floating Flower as I love the colours, its full of fab skin softening ingredients and it smells lovely too. However, Unicorn Horn would have to be my fave from these two - the rainbow colours, stars and glitter are just too damn cute! I almost don't want to use it and just keep it to look at instead, haha! As well as looking pretty, it also contains beautiful neroli and lavender essential oils to nourish the skin. 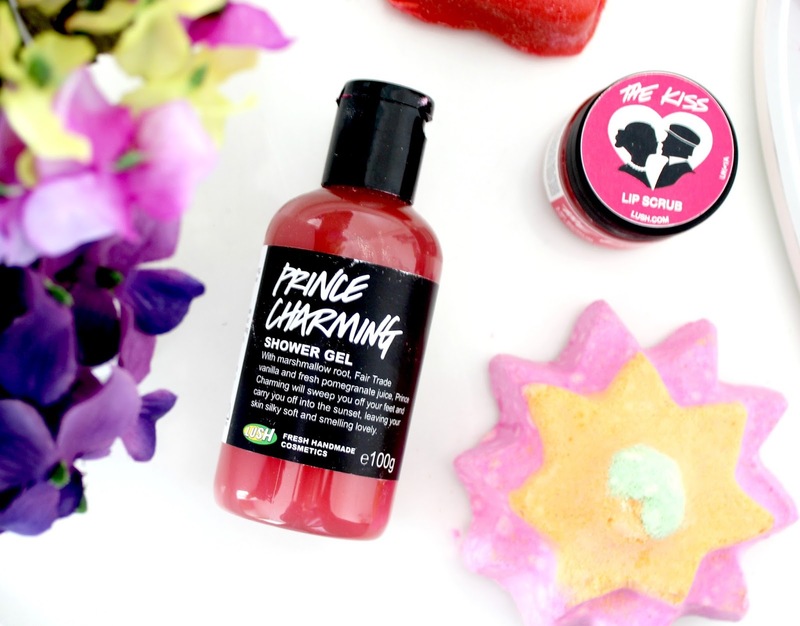 Finally we have the Prince Charming shower gel and The Kiss lip scrub and these are both such fun products for Valentine's Day as they're both love themed. The shower gel smells sweet and fruity thanks to the marshmallow root, fair trade vanilla and fresh pomegranate juice and ingredients such as almond oil will leave the skin feeling silky smooth! The lip scrub is perfect for ensuring your pout is soft and kissable before date night and because its made of caster sugar its safe to eat when you lick the excess of your lips (the best part). It even has red edible hearts and hundreds and thousands mixed into it too. Yep, literally good enough to eat! I have to say, I'm very impressed with all of these products and other than the soap which I could take or leave, I'd definitely purchase these products with my own money. They're all reasonably priced at no more than £5 each and they're the perfect pamper products to get you in the mood for love this Valentine's Day (sorry, that was cringe!). Will you be getting your mitts on these LUSH goodies? aah everything looks and sounds amazing! need to get my hands on these! I cant get over how cute Unicorn Horn looks! Also definetly want to get that unicorn thing!! Already got them! They smell absolutely divine, especially the shower gel. I need to get myself some more for Valentines Day! I can see me treating myself to a few of these on Saturday, perfect 'me' present! I love the idea of the unicorn lush bath bomb, it looks like it would produce such an amazing bath! not to mention treating yourself to a colourful bath on valentines day... sounds like a perfect day ! ordered these today! cannot wait to try them! The valentines exclusives look so good! I can't wait to get my hands on some! I absolutely love LUSH products, I've never tried their Valentine's Day collection, though. It all looks so good! I'll definitely have to try some of these products next year, especially The Kiss lip scrub! I have the limited edition lip scrub from Christmas so I'm sure this one is great, too.